The secretary of the unrecognised Cricket Association of Bihar (CAB) Aditya Verma has shot off another letter to International Cricket Council, urging the highest cricket body to take instant action against the suspended BCCI president. The Supreme Court had forced Srinivasan to be sidelined from BCCI affairs but did not stop him from attending the ICC meet on April 9 and 10. Verma has strongly objected to the move and said that game's top body should act tough on the Tamil Nadu strongman. "The highest court of the country heard the matter. ICC has already violated the court order after allowing Srinivasan to attend the Dubai meet. When a person has been removed of his duties then why is the ICC endorsing Srinivasan. Is it violating its own constitution?," asked Verma in a statement released to the media. The apex court had rejected Srinivasan's plea of being reinstated as the BCCI boss with the Justice Mudgal committee suggesting to carrying out a second round of investigation into the betting and match-fixing allegation that rocked the Indian Premier League season 6. "This is my third letter to ICC but I am still waiting for a reply. Once again I am repeating my allegations against Srinivasan and some cricketers mentioned in the report of Supreme Court constituted probe panel. I want to know from ICC why it is still keeping silent. Is he obliging you (ICC) with any other way because the entire cricket nation wants your clarification," said an angry Verma. Srinivasan's position in the ICC, as one of its directors, can be questioned under various ICC regulations in the light of the Supreme Court observations and orders around the BCCI's handling of the IPL 2013 corruption case and Verma strongly feels the same. "The ICC constitution clearly mentions that a charge sheeted person or his relatives cannot hold any post or attend the ICC meeting. Srinivasan has already been charge sheeted by CBI Hyderabad in another matter," said Verma. With the IPL scam case dragging and unlikely to conclude before August-September, Srinivasan will continue to attend ICC meetings and represent the BCCI. 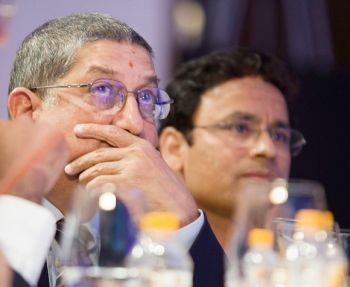 Come July, Srinivasan is in line to become the first chairman in a new-look ICC. His tenure as BCCI chief expires in September 2014. But Verma continues to fight his case against what he calls a "corrupt" system. "Once again I am requesting you to kindly interfere and take appropriate action as per ICC rules. If you fail to do that I am bound to raise the ICC role in the appropriate court," concluded Verma. Sunil Gavaskar is presently the caretaker president of BCCI-IPL while Shivlal Yadav is the interim chief of the Board.